On Sale! This Sterling Silver Miraculous Medal measures 14.75 X 11 MM, or roughly 5/8 by 1/2 inch. It comes with an 18-inch Sterling Silver chain and a beautiful jewelry box. The Virgin Mary said that whoever wears a Miraculous Medal will receive great graces from Heaven! 1 3/4 x 1-inch Sterling Silver St. Benedict Crucifix Medal. Comes as a ready-to-wear package with a 24" endless stainless silver chain and a premium keepsake jewelry box. A proud product of the USA. When will it ship? This Catholic medal usually ships the next business day. 1 x 3/4-inch Sterling Silver St. Christopher Medal. 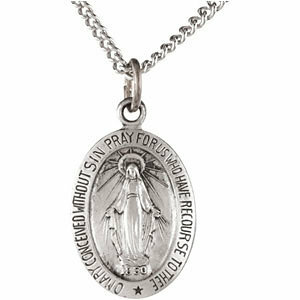 This Catholic medal comes on a 24-inch silver chain, in a beautiful jewelry box ready to be the perfect religious gift. 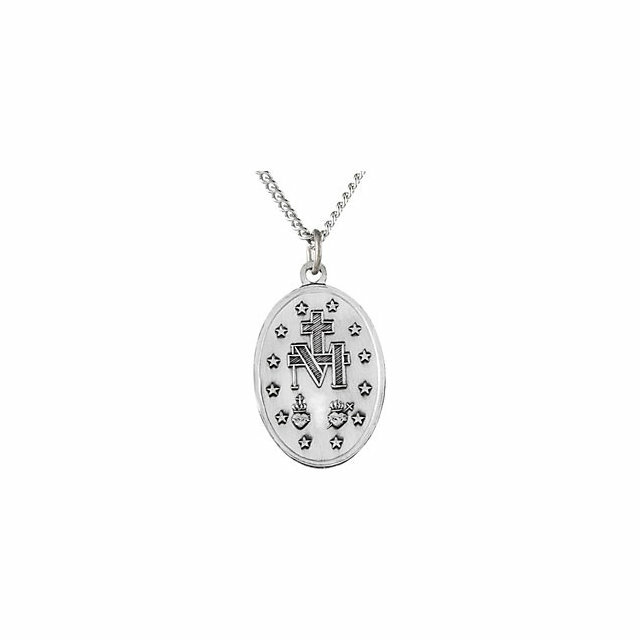 For an additional charge, CatholicShop.com can engrave the back of this Christian pendant with a message of up to 3 lines of text, with 12 characters on each line. When will it ship? Ships the next business day. This 3/4-inch Silver Plated Come Holy Spirit Medal with Prayer on back can only be purchased in these bulk lots of 25 units at a discounted wholesale price, which is now available to the public. These discounted bulk packs offer the perfect solution if you want to give these Catholic goods away as gifts or to use as free envangelizing tools. Imported from Italy. This Miraculous Medal can only be purchased in these bulk lots of 25 units at a discounted wholesale price, now available to the public. The medal is 3/4" and is made of oxidized metal, known for its durability and similarity to the more expensive Sterling Silver. These discounted bulk packs offer the perfect solution if you want to give these Catholic goods away as gifts or use as free envangelizing tools. Imported from Italy. This Sterling Silver Miraculous Medal measures 28.5 X 17.5 MM, or roughly 1 and 1/8 inch by 3/4 inch. It comes with a 24-inch rhodium-plated chain and a beautiful jewelry box. ON SALE FOR A LIMITED TIME! By popular demand, we are now selling an affordable gold Miraculous Medal. This one measures 29 X 18 MM, or roughly 1 and 1/4 inch by 3/4 inch. This Miraculous Medal is made of solid Sterling Silver that has been plated with stunningly-bright 24K Gold, giving it the nice, heavy feel and weight of a genuine gold medal. The medal weighs 3.65 grams. Comes with a 24 inch yellow gold plated chain and is protected by our satisfaction guarantee. The Triumph is the powerful new documentary about the alleged apparitions being reported in Medjugorje, Bosnia-Herzegovina. FOR A LIMITED TIME: Every DVD comes with a FREE souvenir movie ticket and gel bracelet! This beautiful Wood Bracelet features images of the Saints, Jesus and Mary. The holy images on this bracelet include Divine Mercy Jesus, Infant of Prague, St. Jude, Caridad del Cobre (Our Lady over the sea), St. Padre Pio, Sacred Heart of Jesus, Our Lady of Guadalupe, Our Lady of Grace and more. Each rectangular piece is approximately 1/2" x 1/4"
Made of high-quality South American wood by craftsment in Brazil. One size fits all. These durable, attractive St. Benedict Bracelets are handmade by families in Medjugorje. Exorcists consider the St. Benedict medal to be one of the most powerful protectors against evil, which is why these special bracelets feature ten St. Benedict medals woven together with heavy paracord. The slipknot makes them one-size-fits-all. Multiple colors available. See our bulk pricing below. This Small Sterling Silver Miraculous Medal - 50% Off has passed our quality control assessment and meets our strict criteria to be a Catholic Shop product. Buy with confidence. I recently purchased a 6mm Round Clear Swarovski Crystal Sterling Rosary from CatholicShop.com and I can honestly say it is the most elegant Rosary I have ever seen. Thank you for the beautiful engraving and the very prompt and friendly service.